This week on WELSTech we’re talking heart to heart with bloggers about a new blog for parents as well as revealing our Trekkie side and following the MLC College Choir on their Midwest tour. Martin shares a Windows-based Chromebook alternative, and we open the listener mailbag of WELSTech goodness. Blogging for ministry – So you want to start a blog? Martin and Sallie cover the basics of blogging, from content ideas, style and challenges to popular blogging platforms and some of our favorite ministry blogs. New blog on the block – Martin and Sallie welcome Wendy Heyn and Ann Jahns to WELSTech to talk about a new parenting column from Forward in Christ magazine, Heart to heart. Each month a group of parents discuss a parenting topic and the conversation continues online via Heart to heart blog posts and comments. Ann and Wendy share their firsthand experience as new bloggers, and impressions of the supportive Christian community which is developing. MLC College Choir is currently touring the Midwest. Need clock hours? Join us at WELSTech Conference 2015, and we’ll provide a certificate for 13.5 to 21 clock hours! Episode 383 – We’ve arrived at Part 6 of What’s Best Next, WELSTech’s current book selection by Matt Perman, and it’s time to Execute our productivity plans! Watch and participate on 03/10/15 @ 4 pm Central – welstechlive.wels.net. Want to learn more about WordPress? Visit the WordPress Quickstart Video Library or tune in to the WELSTech Instructional YouTube playlist for the WordPress Tutorial 1: Introduction, part of the WordPress Theme Development playlist from LearnWebCode. We wrap up our Summer Software Showcase series this week with a focus on the classroom blogging tool, KidBlog, and the many ways it can be used in an education setting. You won’t want to miss the latest Community Feedback and Martin’s browser tab trick either. Goodbye Summer – Martin and Sallie record the last Summer Software Showcase segment, focusing on ministry uses of the classroom-centric blogging tool, KidBlog.org. Visit our sample WELSTech KidBlog. The login link is in the upper right. This week on the WELSTech Podcast we look at the 7 (or more) best teacher resource web sites. Can we count? – Narrowing the list of classroom resource web sites to the best 7 proved to be a bit tough for Martin and Sallie, so instead they share the best of the best in 7 categories of education sites. 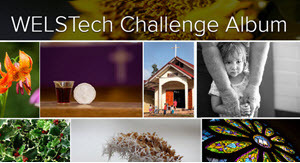 This week’s WELSTech Podcast discussion is on lessons learned from blogging, and Jason Jaspersen joins the conversation to share info on his liturgical art web site, TheCLAPR. Reflections on a year of blogging – Martin, Sallie and Adam Goede, author of The Daily Bible Challenge blog, share their thoughts on the blessings and challenges of regular blogging as well as lessons learned along the way. (16:08) Visually representing worship – Artist and teacher Jason Jaspersen from Minnesota Valley Lutheran High School joins Martin and Sallie to talk about TheCLAPR, The Confessional Lutheran Art Patronage Reference. Jason shares the origin of the site and more about its goals of connecting artists with congregations and leaving a legacy of artwork that speaks to our strong Lutheran confessional stance. Gail Potratz from Emmanuel in New London, WI shared information with the WELSTech Listserve about a presenter who is available to speak to parent’s groups about Internet safety. This week the WELSTech Podcast topic is blogging, and we talk with Pastor Dan Walters about his post-a-day efforts. Blog topics – Martin and Sallie share ideas for your blog, and invite you to take the WELSTech Blogging Challenge. What better way to learn more about blogging and find your personal blogging niche than to post to your blog at least once per week for the rest of 2011. Share a link to your blog so we can follow! (12:48) Pastor Walters is a blogger – Pastor Dan Walters from Our Savior in Springville, NY is blogging every day in 2011! He joins Martin and Sallie to share his experience and tips for successful blogging. Buckle up for this week’s WELSTech Podcast Road Trip. We visit Fond du Lac, WI and talk with teacher Ryan Rosenthal about integrating technology in the classroom. (2:18) Integrating Technology into the Classroom – Seveth grade teacher Ryan Rosenthal from Faith in Fond du Lac, WI joins Martin and Sallie for an interesting conversation about his Web 2.0 classroom experience. Ryan offers great advice including encouraging teachers to “tweak” existing projects to include technology elements, rather than coming up with a new project. This week the WELSTech Podcast Road Trip heads to Liverpool, NY to talk with Pastor Jeremiah Gumm about blogging. (5:50) Pastoral Blogging – The WELSTech Road Trip makes a virtual stop in upstate New York where Martin and Sallie chat with Pastor Jeremiah Gumm from Cross of Christ. Pastor Gumm, the blogger behind The Shepherd’s Study, shares thoughts on his 2+ years of blogging – how and why he started his blog, the mechanics of setting up and managing a blog, and the blessings (64,000 hits and counting) and connections blogging has given him. Tom Hausman from Viterbo University in LaCrosse, WI shared a job posting for an Instructional Support and Design Specialist. Contact Martin for additional details.